Think about packing this up (pack salad & bread separately) for a picnic or a bike ride. If your thing is one of those free evening concerts or movies in the park where everyone spreads their blankets and brings along a spread to eat, this qualifies as budget “gourmet.” Just add wine! Opa! Or, if you’d like, bring it to work. Not nearly as much fun, unless you’re a little evil and enjoy teasing your co-workers with great food. This is a great potluck dish, so it’s going to Fiesta Friday, an ongoing blogger event put on by Angie of the Novice Gardener. Two of my fave bloggers are co-hosting, Ginger @ Ginger & Bread and Loretta @ Safari of the Mind. Everyone, check out their blogs! 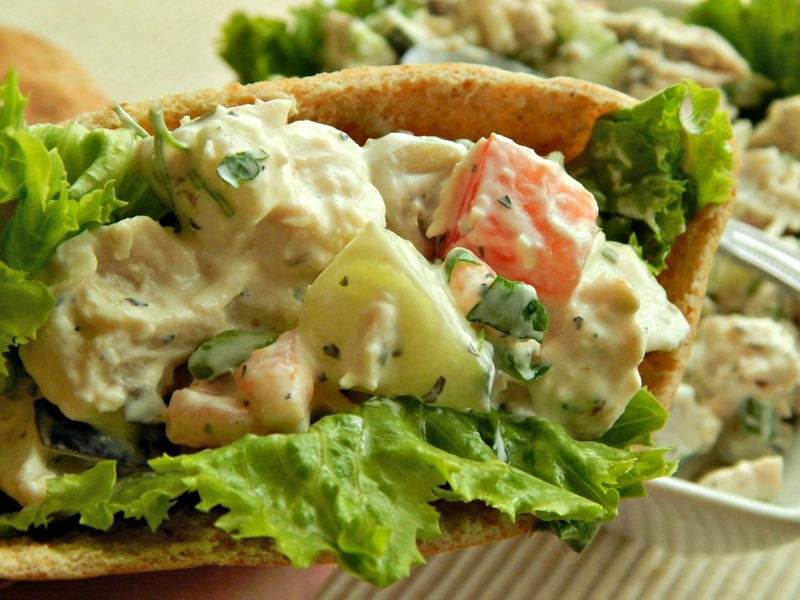 While most of the ingredients in this Greek Chicken Salad are pretty inexpensive, the Pita bread costs a fortune where I live. If you’re on a budget, consider wrapping these up with this Super Easy Flatbread or just making regular sandwiches. Lower carb alternatives would be lettuce cups, wraps or perhaps one of those “thin” buns. Aldi always has great prices on them. Don’t be afraid to riff off a Chicken Salad like this. A few shredded carrots, some finely diced celery, artichoke hearts (marinated would be great) or diced red bell peppers (perhaps roasted?) come to mind. My children weren’t wild about cucumber with the bitter “skin” on it; a compromise is to peel away strips, leaving some of the outside on cucumber. The chicken can be poached or roasted, but this is an ideal use of left over chicken – make extra if you cook chicken earlier in the week just for this dish. I like Greek yogurt as the dressing, but feel free to use any of the suggestions. I’d suggest you use my home-made Greek Seasoning in this, and while you have everything out, make up extra! Any Greek seasoning will work, though, and if you don’t have every spice called for in your cupboard, riff a bit. Use what you do have! Prepare chicken first and allow to cool to room or refrigerator temperature. Dice tomato and cucumber, place in a colander and sprinkle with a bit of salt. Stir around and allow to drain (this straining is optional, but highly recommended) while proceeding with the rest of the recipe. Serve as a sandwich, in a pita, in wraps or lettuce cups. This entry was posted in Click here for Bargain Meals, Click here for Fabulous Food Posts and tagged Bargain Meal of the Week, Chicken, Chicken Salad, Cucumber, Easy Recipe, Frugal Hausfrau, Greek, Green Onion, leftover Chicken, Leftovers, Olives, planned leftovers, Salad, Sandwiches, Tomatoes, Vinegar, Yogurt. Bookmark the permalink. Greek anything I love. Will try this soon! Thanks so much! 🙂 I am, and the same to you! It’s a beautiful day, here. It’s lovely here too. Thank you! Very versatile salad that can be eaten in many ways! I would just spoon it without any bread. Looks fresh and attractive! That is exactly what I did with the bit of left over! 🙂 And thanks much! I am sitting here, licking my lips, wanting a chicken sandwich right at this moment lol. This looks absolutely amazing. So I just had to follow you on social media ;). Thanks! 🙂 I’d actually like to make this again, today! Great looking salad with lots of nice, fresh ingredients. Oh yes, the veggies make it! I think it would be just as good with no chicken and a roasted eggplant instead. This sounds wonderful! I love Greek flavors, but would never have thought of putting them in chicken salad. Great idea! Thanks! It’s the little bit of Feta that really makes it! An excellent ‘Greek’ twist – it seems to be getting warmer in your parts, too, or why would you serve something with a nod to summer? Delicious. And perfect for our Fiesta Friday party tonight! Finally! It’s been crazy! I have a few little baby spring bulbs coming up and they’re so sweet! Thanks, Ginger! You are behind us then: cherries in flower, daffodils gone … it’s definitely Spring! I can’t wait! I’m excited to see my Lilacs and bridal’s veil.